Wishing a warm welcome-to-the-world to Sandy Feet! Whose Feet? Footprints at the Shore, my whimsical ecology-detective picture book in fun rhyming verse! Published by Sleeping Bear Press, and with adorable illustrations by Steliyana Doneva, the book turns a sandy beach into an outdoor classroom as kids find and follow tracks made by all sorts of seaside critters. STEM-based back matter includes information on how clues like footprints can identify the type of wildlife inhabiting any given habitat. School Library Journal awarded the book its coveted star, deeming it "an engaging read which encourages children to explore the natural world around them, and to fully utilize and embrace their senses." Happy, happy book birthday, sweet Sandy Feet! So excited for the book’s super-talented illustrator, Steliyana Doneva, and our ever-supportive publisher, Sleeping Bear Press. 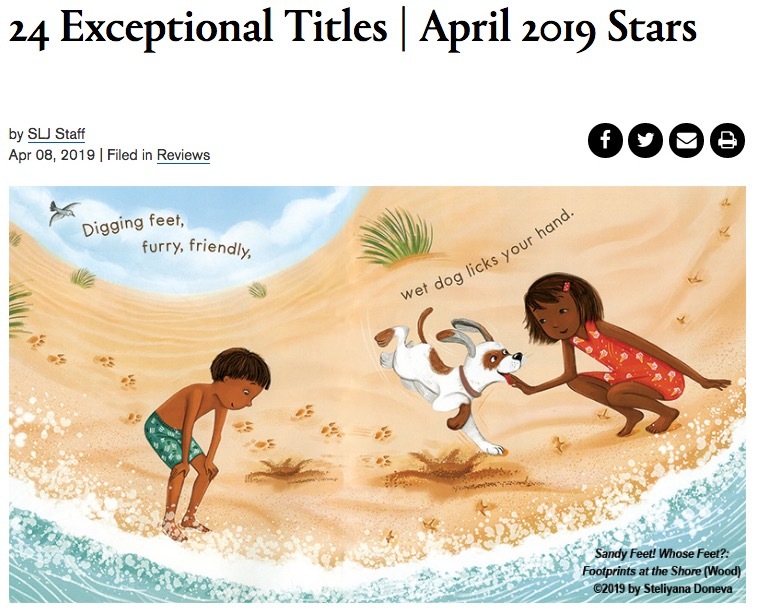 The esteemed trade journal also used a spread from the book in its "April 2019 Stars" roundup. Thanks ever so much, SLJ!